No huge surprises this week - WiiWare sees a game North America got earlier this week, along with Gameloft's latest, while DSiWare gets a single game already previously announced. 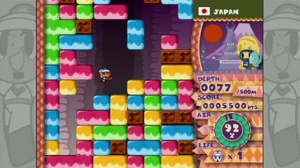 Mr. Driller W is the latest in Namco's now quite well-known Mr. Driller series - A spin-off of the Dig Dug series, you play as the son of its protagonist as you try to dig your way through as many blocks as you can. Like in Dig Dug, danger is always lurking around - You can be crushed by falling blocks or die due to lack of oxygen! It's got a variety of difficulty levels, so everybody will be able to choose an appropriate one, and there's even a few things to unlock. For 800 points, it's fast-paced, frantic, arcady fun, and we highly recommend it. Texas Hold'em Poker is yet another WiiWare card game. We're really not quite sure what the reasoning behind this release is - We got Texas Hold'em Tournament not too long ago, which, although not anywhere near outstanding, was pretty much the best thing poker fans could possibly get. This one has online multiplayer for up to 5 players, which is the same as Digital Leisure's attempt, but it costs 300 Wii Points more, so we'd advise you to be careful for now. We'll review it soon. DSiWare gets a single game this week. The previously announced Oscar in Toyland is actually a bit of a "Virtual Console" game - It's actually the old Amiga/PC game Trolls (Yes, starring those trolls)! However, because the Trolls are now a thing of the past, they've been taken out and replaced with Oscar, who was the hero of a different platformer by the same developer. Confused yet? For 800 DSi Points it's quite a pricy game, but if you're willing to drop the cash it seems like a fairly decent little platformer. It's also pretty much the only choice of a platform game you have on DSiWare! We'll have a review up in a few days. Just these three this week! Let's hope for another Virtual Console game next time! Nothing for me there. Are we gonna get a piece of the Star Wars action? Bad week for VC fans, but at least, you now have Mr. Drilller W. And you got Oscar in Toyland before us. Mr. Driller W would probably be good, but I'm saving my points for LiT. When is it coming? I thought the end of July. I liked Oscar on the SNES. I'll have to check out this Oscar in Toyland when it hits the US. I so hoped for that! Well you guys didn't have to wait too long! 1 wiiware 1 vc for NA, 2 wiiware 0 vc for Uk this week.... Why can't we both have 2 wiiware 2 vc each week or 1 vc?! Trust me, your week is better then what us Americans had to sit through. @SSBF1999 I thought we had a rather nice update this week. What was wrong with this week's update? I thought it was pretty solid, really. Which is very dull when you have Melee and especially with Brawl. Just PLAY those! I think we got SSB or Pilotwings Monday..
@Atlantis1982 Melee is duller than ssb for me cause lots of clone characters and the game is to fast for me. Lets end the Ssb discussion off here ok? Why you mention that though? Whoa! Oscar in Toyland actually DOES have connections to that Trolls game? Well, I'll be. I thought that bear looked familiar. I want Oscar in Toyland! If I had a DSi! Looking forward to seeing how Texas Hold'em Poker turns out. Yuck! where is your VC game? Did Nintendo of Europe get lazy again? wow, the Americans are still complaining that we got a better deal this week? Isn't the only noteworty title here from my POV is Mr Driller which NA also got on Monday and on top of that you guys got that Star Wars VC game that has been hyped to the point that I think there must be some interest. Yes you guys are still waiting for SSB but we had to wait longer for Brawl then you have waited so far, we had to wait 6 months for Super Paper Mario when that came out, we probably won't get Excitebots AND we have to pay upto $100AU ($84US) for games you pay $50US for. $79AU ($66US) if we look around for bargains. Wait... they can allow a slightly redesigned PC/Amiga game on DSiWare, but they say no to Intellivision Lives!? Where is the sense in that? Where's Zombies ate my Neighbors? Still no release date for LIT? What are they waiting for... Christmas?! I wouldn't save my points for something that's been coming "soon" for that long, for all we know it's like Duke Nukem Forever. Mr Driller World, yes! Insta-download. Texas no thanks. Oscar, need a revw. @TwilightV. Its just the way the rules go. Porting a game is fine but using an emulator is no-no. Probably due to emulation compilations being a threat to the virtual console and confusing consumers (they associate WiiWare with new not old). I'm a little disapointed not having a VC title this week, but we did just get Pilotwings and Revenge of Shinobi a few weeks back. 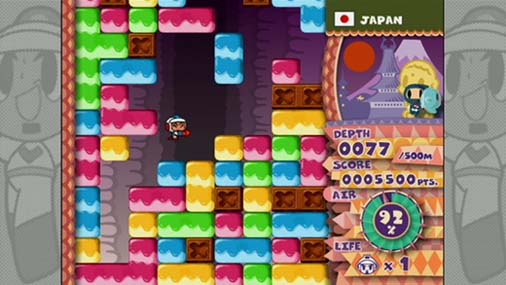 Mr Driller looks interesting but I have too many puzzle games already so might download it at a later date. I too am wondering when we'll see LIT & Cavestory for that matter. LucasArts has only just come on board and are working through their Super Star Wars games which we haven't even got yet. So in a little while, man. @26 Omega That would be one twisted Christmas . No VC= Waste of a week. I was under the impression that Probotector Rebirth was coming in Europe in August but this is the last update of the month and no sign of it. I guess I'll just have to wait a bit longer but I am disappointed as I'd allowed my hopes to be raised by talk of an August release. I know I shouldn't be happy that you guys didn't get a VC game but, well, I am! I mean Smash Bros, Phantasy Star and Pilotwings. Seriously let us catch up before you get anymore good games! As for Super Star Wars, which I'm sure will come back to me as some kind of an argument of our "great games" status, forget it, they aren't that great of games. ^ I second that MattL . Mr Driller W = fantastic. But an 8 for me.